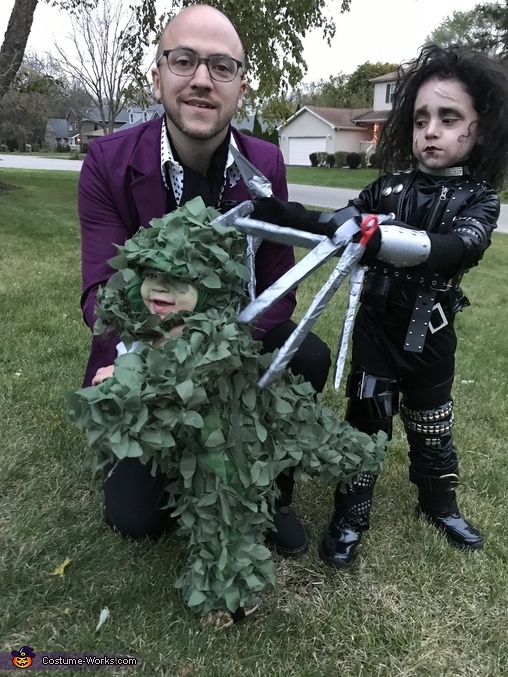 My 4 year old daughter is Edward Scissorhands, and my 1 year old son is the TRex Hedge. We love the movie. Everything is DIY and bought at thrift stores. I used a "pleather" base and lots of belts. I stitched, hot glued and reinforced with electrical tape. Her scissorhands were made out of winter gloves, cardboard and reinforced with popsicle sticks and duct tape. I added scissor handles, 'metal' backs to the hands and spray paint. I used black hair spray, scar wax, and contour make-up to finish the look. I must add that we just had our 3rd child so I made these while over 9 months pregnant! It was a blast to do and the kids had so much fun on Halloween.